Waiting on Wednesday is a feature normally hosted at Breaking the Spine, though it hasn’t been updated during January. Regardless, I felt the need to share this one. Kell is one of the last Travelers—magicians with a rare, coveted ability to travel between parallel universes—as such, he can choose where he lands. There’s Grey London, dirty and boring, without any magic, ruled by a mad King George. Then there’s Red London, where life and magic are revered, and the Maresh Dynasty presides over a flourishing empire. White London, ruled by whoever has murdered their way to the throne—a place where people fight to control magic, and the magic fights back, draining the city to its very bones. 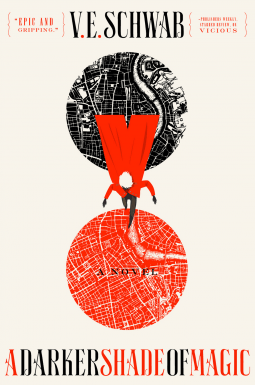 And once upon a time, there was Black London…but no one speaks of that now.Officially, Kell is the Red Traveler, personal ambassador and adopted Prince of Red London, carrying the monthly correspondences between the royals of each London. Unofficially, Kell is a smuggler, servicing people willing to pay for even the smallest glimpses of a world they’ll never see—a dangerous hobby, and one that has set him up for accidental treason. Fleeing into Grey London, Kell runs afoul of Delilah Bard, a cut-purse with lofty aspirations, first robs him, then saves him from a dangerous enemy, and then forces him to spirit her to another world for a proper adventure. Since I received access to the preview excerpt on Netgalley, my first Waiting on Wednesday post for a while is an obvious choice… V.E. Schwab’s A Darker Shade of Magic. I have various of Schwab’s books somewhere on Mount TBR, some lurking in the foothills even, but I haven’t got round to them. Based on the small part of the excerpt I read, I think A Darker Shade of Magic will probably be the first book I read by this author. I didn’t stop reading because I didn’t like it: quite the opposite. I usually hate teasers when I can’t get hold of the full book, and that’s exactly what happened in this case. I really, really want the book already, and I only read a few pages, skimmed a bit more, and generally skidded over the surface of the book. I mean, when you open with this, what do you expect? I don’t know if anyone needs to read further, but I sure don’t. I’m hooked, if just to hear more about that impossible coat. A Darker Shade of Magic is out February 24th 2015! I’m really looking forward to it, definitely! That is quite a teaser – I haven’t read any of Schwab’s work, although I’ve certainly seen it around, but this may very well make the TBR list. I’m looking forward to it. I do have others of Schwab’s to read, but I think this’ll be the first. Yeaaaaah. I want it now. Me toooooo. I should actually pre-order it so it gets delivered on release day. I’ve been looking out for ARCs, but no luck. Alas!